The 185th Semiannual General Conference of the Church of Jesus Christ of Latter-Day Saints took place this weekend and was broadcast throughout the world. For the first time in a very long time, I sat and watched it in my home, surrounded by my family. At first, I had intended to choose a single talk upon which I would base this week's post. As I listened, though, I realized that choice would be nearly impossible to make. 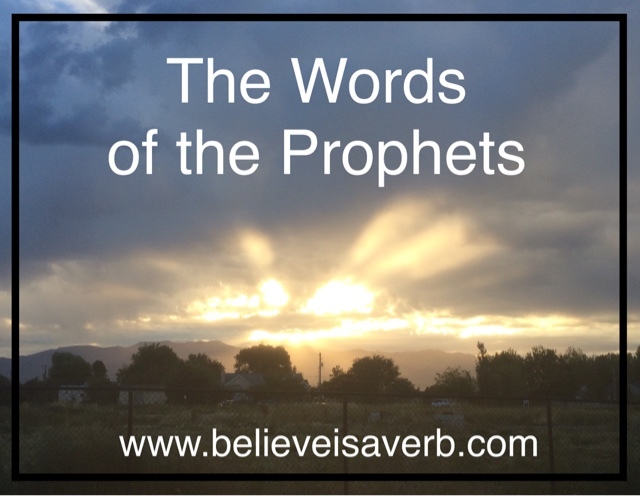 So many things spoken by the apostles and prophets of our church resonated deeply with me. It would be like trying to choose a favorite sunrise. Each illuminated my life and opened my eyes to things the Lord expects of me. So I choose to share those words that touched me the most - quoted from the church's official website, www.lds.org, in hopes that you will be touched by the holy spirit and find the answers you seek. *While part of General Conference, the General Women's Session is traditionally held the weekend prior to the main body of the conference. In addition to this quote, I found President Uchtdorf's talk from this session especially inspiring and beautiful, which is why I based last week's post on his words. Before I present quotes from this session, I must preface them with my own testimony of our blessed prophet and president of our church. Today, as I watched him speak, I was filled with a certainty beyond which doubt could ever reach, that he truly is a prophet of God. My soul sang with the words he spake and as he desperately struggled to bear his glorious testimony of Christ, I felt my spirit cry out to give him the strength to continue just a bit longer. For he truly is the mouthpiece of Christ and I yearn to hear what our Lord has to say through his trusted servant. That said, as I listened to President Nelson speak, my soul once again felt the stirrings of the Comforter and I know the Lord's plan is sure. When the time comes for President Monson to join the righteous men who have gone before, the Church of Jesus Christ of Latter-Day Saints will be in good hands. When the scriptures tell us to 'feast upon the words of Christ', it is through the words of our prophets at this spiritually filling conference we are blessed to have twice a year. My heart is full and my soul must take time to digest all that has been taught and shared. I am truly grateful to have such worthy men and women at the head of this amazing organization. They lead us through the storms of life and aid us in our times of need. And for this, I must raise my voice in praise and joy. Thank you, dear Father! Thank you now and forevermore! Glory to God in the highest! In the beloved name of Jesus Christ, our Savior and Redeemer, amen.